Osteotomy of the knee is surgery that involves making a cut in one of the bones in your lower leg. This can be done to relieve symptoms of arthritis by realignment of your leg. Tibial osteotomy is surgery done on the shin bone below the knee cap. Femoral osteotomy is surgery done on the thigh bone above the knee cap. You will be pain-free during surgery. You may get spinal or epidural anesthesia, along with medicine to help you relax. You may also receive general anesthesia, in which you will be asleep. Your surgeon will make a 4 to 5 inch (10 to 13 centimeters) cut on the area where the osteotomy is being done. The surgeon may remove a wedge of your shinbone from underneath the healthy side of your knee. This is called a closing wedge osteotomy. The surgeon may also open a wedge on the painful side of the knee. This is called an opening wedge osteotomy. Staples, screws, or plates may be used, depending on the type of osteotomy. You may need a bone graft to fill in the wedge. In most cases, the procedure will take 1 to 1 1/2 hours. 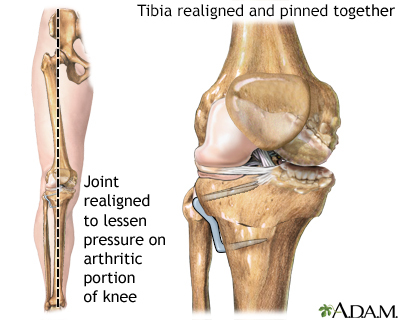 Osteotomy of the knee is done to treat symptoms of knee arthritis. It is done when other treatments no longer offer relief. 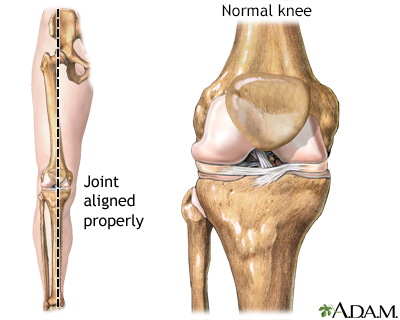 Arthritis most often affects the inside part of the knee. Most of the time, the outside part of the knee is not affected unless you have had a knee injury in the past. Osteotomy surgery works by shifting the weight away from the damaged part of your knee. 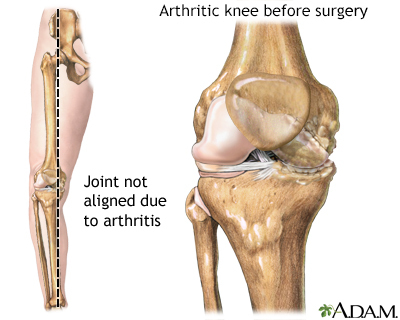 For the surgery to be successful, the side of the knee where the weight is being shifted should have little or no arthritis. Tell your provider if you have been drinking a lot of alcohol -- more than 1 or 2 drinks a day. By having an osteotomy, you may be able to delay the need for a knee replacement for up to 10 years, but still stay active with your own knee joint. A tibial osteotomy may make you look "knock-kneed." A femoral osteotomy may make you look "bow legged." You will be fitted with a brace to limit how much you're able to move your knee during the recovery period. The brace may also help hold your knee in the correct position. You will need to use crutches for 6 weeks or more. At first, you may be asked to not place any weight on your knee. Ask your provider when it will be OK to walk with weight on your leg that had the surgery. You will see a physical therapist to help you with an exercise program. Complete recovery may take several months to a year. Crenshaw AH. Soft- tissue procedures and corrective osteotomies about the knee. In: Azar FM, Beaty JH, Canale ST, eds. Campbell's Operative Orthopaedics. 13th ed. Philadelphia, PA: Elsevier; 2017:chap 9. Feldman A, Gonzalez-Lomas G, Swensen SJ, Kaplan DJ. Osteotomies about the knee. In: Scott WN, ed. Insall & Scott Surgery of the Knee. 6rd ed. Philadelphia, PA: Elsevier; 2018:chap 121.